When all is said and done, how does society punish offenders? Are penalties imposed in an attempt to fight crime and prevent the repetition of future unlawfulness, or rather does it condemn the offenders to a lifetime of punishment? The status quo sees offenders continue to ΄pay΄ for their illegal acts, even after serving their sentences. For many, atonement never comes, and they continue to occupy the sidelines well after their alleged reintegration into society. This because when once out of prison, there is a serious possibility that all doors are closed to you, you are stigmatized, ultimately leading to a longer, hidden sentence lasting the rest of one’s life. In some cases the legal & welfare state loses sight of its objective and, by hobbling ex-prisoners, often creates more problems than previously existed. What we really need are ways and solutions for an effective reintegration of ‘sinners’, who have already ‘paid’ their debt with deprivation of their liberty. One rehabilitation center for ex-prisoners is ‘Epanodos’ (‘Return’). This is a relatively new, non-profit entity, provisions for which have existed in the Greek Correctional Code since 1999. As noted, however, by its staff, bureaucratic obstacles delayed the establishment of the entity, and effective operation began in 2007. Since May 2008 former inmates may visit the offices of ‘Epanodos’ (www.epanodos.org.gr) to receive psychological, legal and general support for their initial steps into society post -incarceration. The assistance available is substantial, and can meet needs for temporary housing, food, jobs and free travel on public transport. This is an organization in its infancy, and it is important to support its efforts to provide assistance for people in need. 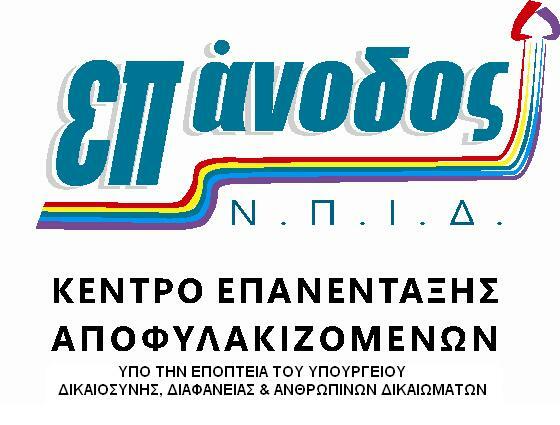 EPANODOS operates under the supervision of the Greek Ministry of Justice. Its inception and operation has been effected under the Penitentiary Law (art. 81§2) and Presidential Decree 300/2003. The Greek Minister of Justice appointed the board of EPANODOS in March 2007, upon which it began operating. The primary objective of EPANODOS is the resettlement of ex-offenders back in to society, and mainly, to enhance and promote their working skills and abilities. In this way it helps them to access the labor market. EPANODOS also offers consulting and psychological support and tries to create the necessary infrastructures for the ex-offenders. Our discussion with the latter, and Ms. Despina Tsaousidou, a social worker, is worth reproducing here. - You come in contact with a significant number of ex-prisoners. What are they like in general, how do they behave? D.T. : In general these people are very frustrated, very angry, they have difficulty trusting others. There are those who expect everything from you, as if you are all-powerful. Of course, it΄s also a way for them to communicate. The good thing is that ‘Epanodos’ enables them to speak to us, offers some stability, some continuity in this relationship. They know that "if I need it I will go there" and slowly with small steps they come to trust us. But this needs time and patience. - Is there information in the prisons? F.M. : There is a liaison with the Justice Department and some contacts in order to have support in the prison, because the preparation for release should begin from inside the prison. However, there are some prisons with no social welfare officers or qualified staff. - Have you considered conducting information inside the prison? D.T. :This is a very good suggestion. It is possible, but this requires scientific expertise; we need more time, we also need permanent personnel. We are not permanent employees. There must be a long term effort in this direction. It cannot be done now whilst scientific collaborators may come and go... This lack of continuity and stability in employment is problematic for social services in Greece. - How do you help with housing, sustenance and employment? Do the goals of ‘Epanodos’ for vocational training of prisoners include training to help them cope better with the demands of the workplace? F.M. : For the newly released, ‘Epanodos’ provides accommodation in a hotel, paid for by us. It is temporary of course, for 10-15 days let’s say. Sustenance is provided too, and may be continuous under cooperation with the Greek Orthodox Church, the municipality and the Parish, according to which jurisdiction the ex-prisoners reside in, and special services of each institution. Regarding the vocational aspect, we are forming a link with vocational training centers, which have submitted proposals to the relevant bodies in order to implement some training programs. So, with this connection we believe some of the beneficiaries of ‘Epanodos’ will be included in these programs, depending of course on their own requests and needs. There is collaboration with OAED (the Greek Employment Service) particularly for minors to be promoted into Apprenticeship programs. Also, our consulting services include advisory services in addition to psychosocial support. We have contacted some 100 large-companies, informed them about our rehabilitation effort and have sought to create a ‘bank’ of employers who may in future recruit some ex-prisoners. - Is the financial support you receive sufficient? F.M. :We are mainly funded by the Ministry of Justice, but there are donations from famous and anonymous citizens who assist the work of ‘Epanodos’. And indeed we have been positively received in a society with active citizens who want to help each other. We set up a voluntary group and the response has been warm. - How can the volunteer group assist the beneficiaries of ‘Epanodos’? F.M. :There can be a bazaar, or an event, but it may also involve awareness-raising activities, such as setting up a booth in a central square to distribute brochures, etc. Or there may be smaller groups that approach citizens and others to inform them about ‘Epanodos’ and the stigma faced by ex-prisoners. Our volunteer team has already begun its first meeting with topics related to volunteerism and reintegration. - What is the general profile of the average ex-prisoner who approaches ‘Epanodos’? F.M. : They come from all age groups, though it is mostly 35 to 50 years old. There are many foreigners here and there is a Legal Advisory Department to handle the residence issues. Most are men, of course, because the majority of prisoners are men. As for their requirements, it is mainly for work and financial aid. They have committed a range of crimes, mostly drug-related, which is not surprising given that according to Greek criminological researches, most of incarcerated criminals are there on drug-related charges. - Do you see the same faces over time? D.T. : Yes they come often, since they are genuinely in need. Other times they are in need yet do not come. In many cases it is people whom nobody cares for and when you show a little interest they usually respond with surprise. I think the most important thing is for them to learn to ask for help when they need It, in an appropriate manner. - May pride prevent them from coming to you? C.F. : Yes, pride is an issue... They think: “Sure, now they will tell me”, “I know, nothing is ever done”. We are an institution of the Ministry of Justice and they often see in us the guards, or the judge. They may express anger to our faces that is not directly aimed at us. - Overall, is there progress being made with those who come? Does it improve their lives? D.T. : The evaluation is difficult to make directly, because many times you say something now and it is exploited after a long period. There is a follow up monitoring and usually there are other needs that have emerged and will be identified at that moment. What we can measure is the number of ex-prisoners who have managed to get welfare relief, and will tell you with pleasure and relief "Thank you”. This is the direct feedback we get. And many times there are things that can seem so meaningless, such as writing a letter and sending it somewhere for them, but yet are important for them. They say “Thank you” and you say “I did not do anything; I am just doing my job." - A general comment, is there something you would like to change? D.T. : The main issue for me is Greek social policy; it is right to fund welfare and ex-prisoners, as this is the only way to stop the course of crime, the reproduction of crime which does not benefit anyone. And there are others who just need an opportunity. When they get this they can progress. I recently got a phone-call from an ex-prisoner who had actually restored his life and wanted to volunteer with us. His message was very optimistic: "You know something; if you try hard you manage”. Even though the latter comment makes a very good conclusion to this interview, it is worth adding that the individual effort that each of us makes is not enough. Recently I met a man on the street, around 30-35, with a blank look like he could not focus or was not accustomed to looking others in the eye. An wretched figure, wandering among the crowd claiming he had just been released and needed money to return to his village. I summoned the courage to talk to him about ‘Epanodos’, I had doubts myself, because he looked so hard to talk to. He reacted with surprise, as if I were from another planet; he seemed to have lost any human contact long ago. The result was disappointing. He repeated like a mantra that he wants to go to his village, and muttered that no one could help. Naturally, the above case is a random incident; the man may have been misleading, but this is not the point. The point is that if any of these people who circulate like "empty vessels" really want help, it should be administered. Prisons should provide clear and accurate information to the prisoner on the existing organizations that can help smooth reintegration into society. We must understand that life does not end for a man in jail, nor should they be punished forever, stigmatized and marginalized. Nobody said that things are perfect. Let us not contribute however, to the decline. Where justice is absent let us build it ourselves.